Adelaide Strikers eye revival against Thunder. 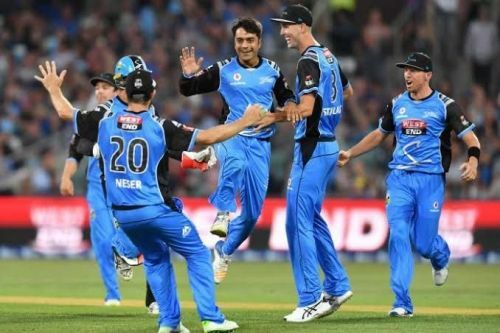 Adelaide Strikers are set to host Sydney Thunder for the final T20 fixture of 2018 at the Adelaide Oval in Adelaide on Monday, December 31. Both teams have faced each other in eight completed BBL matches fixture with the Strikers leading the scoreline 5-3. In their previous faceoff during BBL 07, Strikers secured a 25-run win at the Sydney Showground Stadium. Batting first, the Strikers posted 158/7 in their quota of twenty overs, then restricted the Thunder's chase at 133/9 to seal the match. After beginning their season with an emphatic five-wicket win against Brisbane Heat, the Strikers lost their plot afterward and faced a five-wicket defeat against the Melbourne Renegades followed by a seven-wicket loss at the hands of the Perth Scorchers. Strikers batters failed miserably against Perth and could manage just 88 runs, which is their worst performance in recent times. The fact that six of their batsmen were back in the pavilion with single-digit scores explains the case. They will aim to forget it as an odd day affair and come out with much better intent against Thunder. They will mostly rely on the services of Alex Carey and Matthew Short, Carey scored an entertaining 70 runs in the opening fixture against Brisbane Heat. While Short played a crucial 65 run knock against Renegades. Meanwhile, Jonathan Wells scored 24 and 42 in first two outings and him along with skipper Colin Ingram, who has not been among runs so far, must come out with a quality innings here. The Strikers' main bowler Rashid Khan has taken the most wickets, five in three games, and was most economical bowler last time with figures of 0/9 in four overs. With the untimely demise of his father, it is quite unlikely that he will feature in the starting eleven for the match, and Liam O'Connor may get an opportunity if the team goes for a like-for-like replacement. While Billy Stanlake has also been impressive with five wickets and the team will need these to crack few breakthroughs early on. Colin Ingram (C), Matthew Short, Jon Wells, Jake Lehmann, Michael Neser, Liam O'Connor, Peter Siddle, Ben Laughlin, Billy Stanlake, Alex Carey and Jake Weatherald. Sydney Thunder bank on confidence against Adelaide. 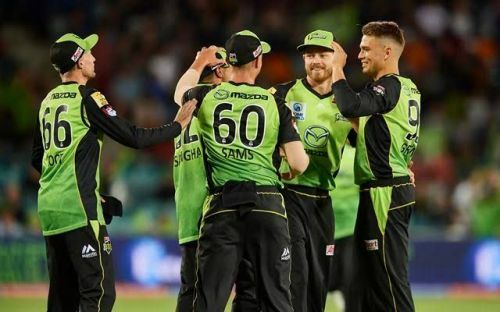 After a dream start to the season, their winning run came to an end in the previous game against Hobart Hurricanes as they lost by seven wickets. Despite this, they will take a lot of confidence from their impressive performance in previous fixtures and come out thrashing against Strikers. Jos Buttler is coming off a 54-ball 89 against Hobart Hurricanes and 37-ball 63 against Sydney Sixers. He is going through a supreme run of form and can be a disaster for the opposition if not dismissed early. While Jason Sangha was the top performer in the opening game with an unbeaten 63, he failed to replicate his show in next games and will be expected to make a decent score against Adelaide. Except these two the team will also need a strong contribution from skipper Shane Watson and Joe Root. Both are yet to unleash their level and the Thunder will expect one of them to put their best against the Strikers. Despite an exceptional run in batting, their bowling has been a concern for the Thunder. Their bowlers failed to defend a massive target last time out with Sam Rainbird (2/25) being the only bowler to pick wickets. While Fawad Ahmad and Daniel Sams have shared nine wickets between them in three matches, and are expected to stifle the opponents in early overs. Shane Watson (C), Callum Ferguson, Joe Root, Jason Sangha, Daniel Sams, Chris Green, Jos Buttler, Nathan McAndrew, Jonathan Cook, Sam Rainbird and Fawad Ahmed.